A while ago I watched a Horizon programme concerning the search for dark matter – that elusive material which many scientists believe to account for the ‘missing mass’ in our universe. I was intrigued by the underground experiments being conducted at Boulby Mine in North Yorkshire that were featured in the programme. What an amazing place for a DDAS visit that would be I thought! I made the suggestion to our Secretary Dave Selfe and he got in contact with the group at Sheffield University who are conducting the experiments at the mine. Luckily for us they do allow small groups down the mine from time to time and we booked ourselves on a visit. 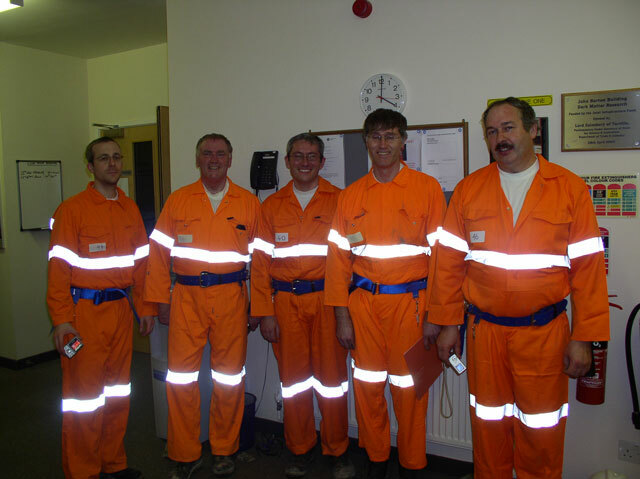 So on the 15th November 2006 a group of six of us including myself, Arthur Tristram, Mike Dumelow, Graham Ensor, Neil Clifford and Adrian Brown travelled up to North Yorkshire for what was to be a trip down the deepest mine in the UK. We were met by Dr Sean Paling of the Institute for Underground Science (IUS), Department of Physics and Astronomy, University of Sheffield, who was to be our guide for the day. 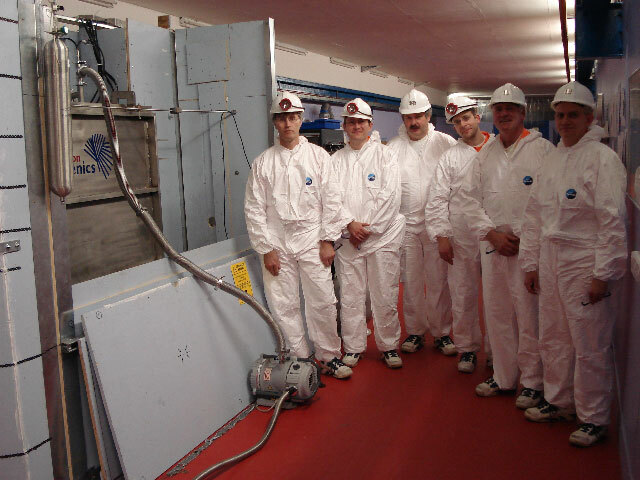 He showed us into the John Barton Building – the purpose built surface facility for dark matter research at the mine site. As well as offices this building contains laboratories, computing facilities, a kitchen, conference room, shower and changing rooms. 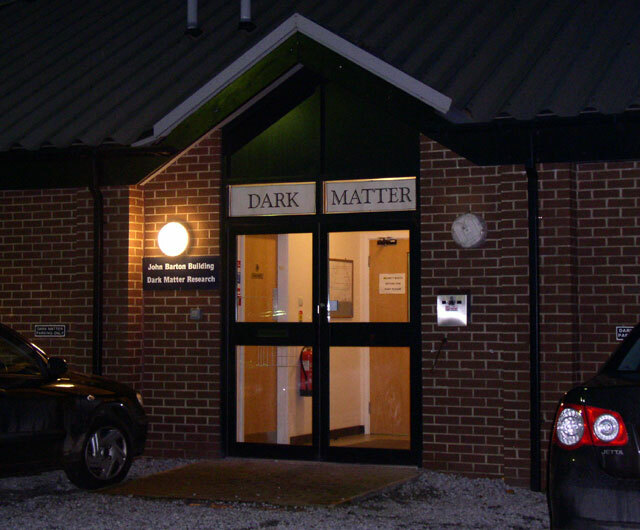 The dark matter facilities at Boulby are part of the IUS, which in turn is a member of the UK Dark Matter Collaboration (UKDMC), which also includes the CCLRC - Rutherford Appleton Laboratory (RAL), The University of Edinburgh, and Imperial College London. Funding for the dark matter facilities at Boulby is largely provided by central government in the form of a Joint Infrastructure Facility (JIF) grant. After an overview of what we were to expect from our tour and a brief introduction to the facility, Sean showed us to the changing room where we donned the clothing required for our visit down the mine. This involved removing shoes, shirts and trousers, and donning a T-shirt, an orange reflective one-piece overall, equipment belt and safety glasses. Any valuables and anything containing batteries were removed and placed in lockers. Next we had a safety briefing where the mine safety procedures and precautions were explained to us. We were also shown how to use the self-rescuer. These are portable oxygen sources for providing breathable air when the surrounding atmosphere is contaminated or un-breathable, for example in the unlikely event of a fire down the mine. Boulby Mine itself is a working potash and rock-salt mine located between Saltburn and Whitby on the North Yorkshire coast. It was opened in the late 1960s by ICI but is now owned by Cleveland Potash, a subsidiary of ICL Fertilizers. It is the UK’s only working potash mine, and supplies the fertiliser and other industries with over 1 million tons of potash and more than half a million tons of salt each year. Potash is the natural form of potassium chloride (KCl), while the rock salt (halite) is sodium chloride (NaCl). The potash is extracted during weekdays and the salt at weekends. The latter is used for de-icing roads. These minerals were deposited 230 million years ago in the Late Permian period by the evaporation of sea water at the edge of a vast basin that geologists have termed the Zechstein Sea. This shallow sea stretched from what is now the east coast of Britain, across much of what is now the North Sea and into Germany. Today these salts occur at a depth of between 850 and 1300 meters beneath the surface, making Boulby the deepest mine in the UK. Staggeringly, the mine comprises over 1000 km of tunnels! These stretch out in a complicated maze beneath the North Sea as well as inland. Although not part of our tour today, a journey to the working faces involves a long drive! 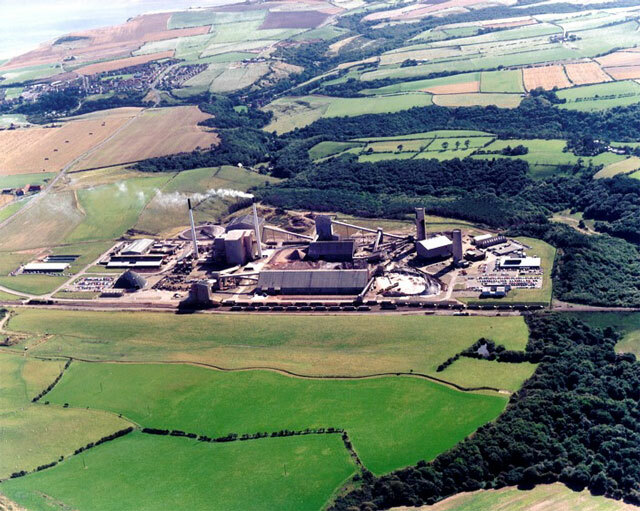 Aerial view of Boulby Mine on the North Yorkshire coast. Credit: Cleveland Potash Ltd.
After the safety briefing we were ready to walk over to the mine itself. Walking out of the John Barton building with the group all kitted up one felt like an astronaut about to go off to the launch pad! Except in our case we were going in the opposite direction from space! Sean took us to the lamp room where we were each given two metal tokens. One is a small triangular piece of aluminium, the other a small brass disc. These are clipped to one’s belt and used to tally exactly who is down the mine at any one time. We each took a self rescuer and attached this to our belt, and also a lamp which clips to the helmet and is supplied by a lead acid battery which attaches to the belt. Then we passed down a corridor and through three heavy metal doors which led to the top of the mine shaft. When Sean opened the first door there was a momentary shift in air pressure which was felt in the ears, as the shaft is isolated from the outside world. There are two shafts at Boulby – a ‘man shaft’ for taking people, and a ‘rock shaft’ for extracting the potash and salt. The top of each is marked by a tall cylindrical concrete tower which houses the lifting gear. It was at the base of one of these towers at the top of the man-shaft that we entered the cage for our journey into the underworld. Just before entering the cage we handed the triangular token to the attendant to record our presence down the mine. There was no lighting in the cage other than our own helmet lights and one had a keen sense that we were about to go somewhere very special indeed. The cage began to move down very slowly at first and then picked up speed. The descent itself took 6 minutes to reach the bottom of the 1150 metre deep shaft! While descending the walls of the shaft could be seen racing by and the sound of the air rushing past the cage was also noticeable. 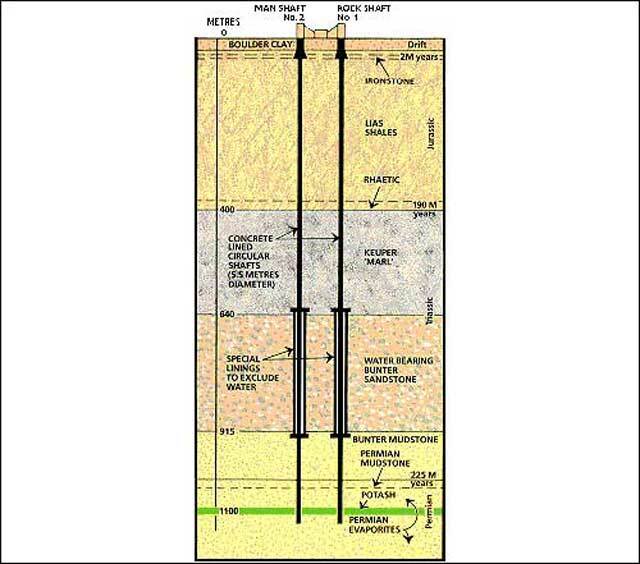 For part of its length the shaft passes through porous sandstone containing water under high pressure and is protected by a special liner to prevent seepage or flooding into the mine. The cage gently slowed before stopping at the bottom of the shaft and we walked out into the mine. Geological section of Boulby Mine showing the 1150 m deep shafts. Credit: Cleveland Potash Ltd. The tunnels and caverns in Boulby Mine are cut into the rock salt as this is structurally stable enough to contain them. The potash occurs as a layer within the rock salt sequence and is too soft to hold the tunnels themselves. The mine tunnels are essentially roadways and were as wide as a road on a typical housing estate and maybe 12 feet high to the roof. For the most part they were not lined and the walls, floor and ceiling were all rock salt. The ground was smooth and glistened like ice where vehicles had compacted the halite. There was a refreshing draft of air being blown down from the shaft when we walked out into the mine. Due to the geothermal gradient the rock temperature at this depth is 40 °C and the mine is cooled by pumping surface air down one shaft, circulating it around the whole mine, and extracting it up the other. From the shaft bottom we had a walk of about 600 metres through tunnels to the underground laboratory itself. The only light was from our helmet lamps and the tunnels receded into eerie blackness. Occasionally a vehicle would come along the tunnel and we would move to one side to let it pass. The dark matter laboratory was accessed by a door at the end of a short ‘stub’ or side chamber in one of the tunnels. Stepping over a high sill (not unlike that in a door in a ship’s bulkhead) we entered a small corridor along the side of the lab. Here we each had to use a wall mounted vacuum cleaner to remove the loose dust from our boots before entering a small well lit staff room with central table, chairs, a drinking water machine, medical kits, display screen and phone etc. The ingredients for someone’s tuna sandwich were on the table! Sean stressed the need to keep hydrated as the air was very dry down the mine and we had been walking through warm tunnels. It was in the 30s Celsius in the tunnels outside the lab but here the temperature was lower, as the lab has its own air conditioning. This is necessary because the lab interior is not exposed to the airflow in the mine outside and requires its own environmental conditions and dust free environment. After Sean gave us more background into the facility we then had to go and change our clothing once more. Off came the mine boots and helmets, and we all donned fresh white climb-into zip up clean-suits over our orange overalls. 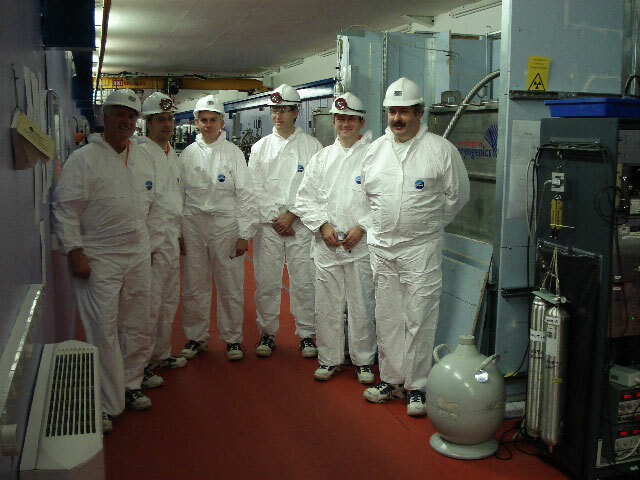 Looking like the Norwegian army on Arctic manoeuvres we then put on trainers and clean helmets and had to pass, one by one, through an airlock to reach the clean room conditions of the experiment area. In the airlock with both doors closed, one stood in a blast of air for 15 seconds to remove any remaining dirt and dust, before emerging into the clean room environment. Here the lab consists of a long gallery and several other rooms housed in a wood and steel framed structure contained inside a purpose built cavern. The walls floor and ceiling of this area are designed to allow for deformation in the surrounding rock. Despite the general stability of the roadways and chambers the rock salt is nevertheless under a high stress at this depth and deforms over time. In fact the material creeps at about the same rate fingernails grow, that is to say up about 1 cm per year. Since the lab was built in 2003 the floor has in places bulged upwards! Despite this unusual fact and the lack of windows one would otherwise have no clue that this air conditioned, brightly lit and squeaky clean world was over 1100 m underground! Before I go on to describe the experiments we visited let’s take a look at what this dark matter is all about. There are several pieces of scientific evidence that suggest that most of the matter in the universe is composed of a so far un-detected particle that interacts only weakly with the matter we are more familiar with. For more familiar read the protons, neutrons and electrons etc. that make up you, me, this planet, stars, galaxies and so on. The main contender for dark matter is the Weakly Interacting Massive Particle (or WIMP for short). WIMPs are predicted by a number of extensions to the Standard Model of particle physics, especially supersymmetry. One line of evidence for missing mass is that stars in the outer reaches of galaxies orbit faster around those galaxies than can be accounted for by the gravitational force of the matter we already know about (in the form of stars, planets, gas and dust etc). Unless there is something wrong with our theory of gravitation then there must be a halo of dark matter surrounding the galaxies in order to account for the gravitational effect on galactic rotations. Measurements suggest that 90% of the matter in almost all galaxies must be in a form we have not otherwise detected! Another line of evidence comes from gravitational lensing. This is where the light from a distant object such as a galaxy is bent around a massive foreground object such as a cluster of galaxies by the gravity of that foreground object. Such lensing was in fact predicted by general relativity. The background galaxy may appear as a distorted ring around the foreground cluster or as multiple images. Again, the amount of matter required to provide the gravitational effects needed to account for the lensing is more than can be supplied by the stars, gas and dust we know to be present in the foreground cluster of galaxies. 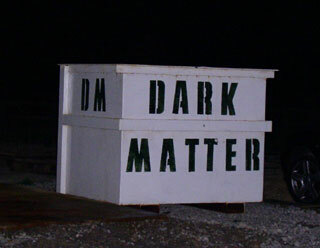 Because it interacts only weakly with ‘ordinary’ matter, dark matter is excruciatingly difficult to detect. Experiments to find dark matter must be shielded from the ambient cosmic rays that continually bombard the Earth from space. This is because the cosmic rays would otherwise swamp the experiments with background noise rendering the effects of dark matter particles impossible to distinguish. Cosmic rays are primarily composed of atomic nuclei travelling at a significant fraction of the speed of light. They originate from highly energetic processes throughout the universe. On hitting the nuclei of atoms in the Earth’s atmosphere they create showers of secondary particles called mesons. The mesons are unstable and in turn decay into muons which interact little with the atmosphere and are able to reach the surface as a form of ionising radiation. By placing the dark matter experiments over 1100 m underground the muons have largely been absorbed by the overlying rock. 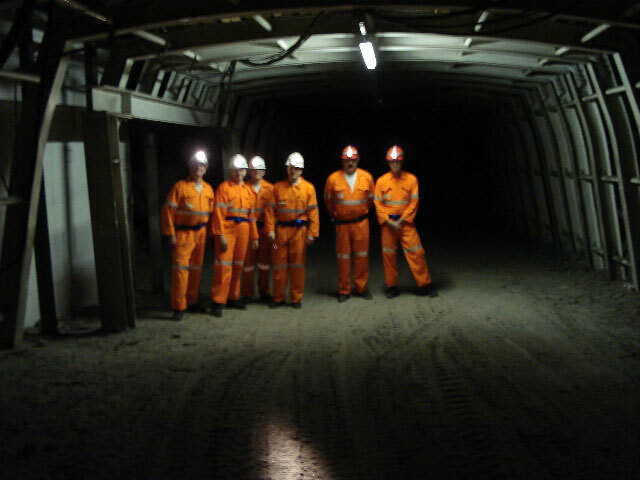 The rock salt layer at Boulby is itself relatively low in elements that produce background radiation, making the environment down the mine even quieter from a radiological perspective. Nevertheless there is still a certain level of natural ambient neutron radiation emanating from the decay of uranium and thorium atoms in the surrounding rock, and measures are taken to shield the experiments further from this residual source. There are currently two world renowned dark matter experiments in operation at Boulby - ZEPLIN-II and DRIFT-II, and Sean introduced us to both. ZEPLIN stands for ZonEd Proportional scintillation in Liquid Noble gases. 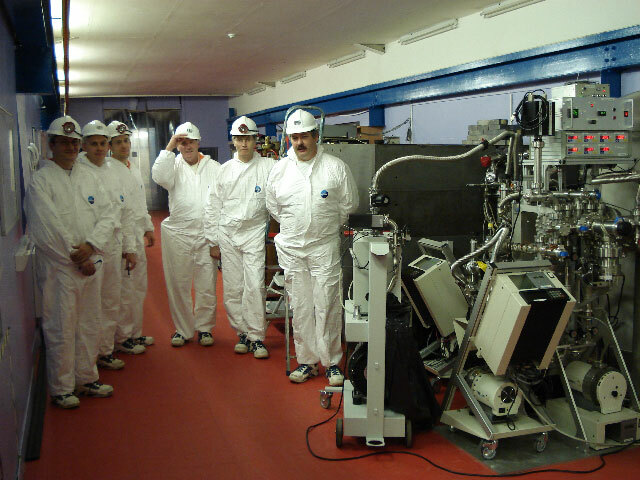 At the heart of ZEPLIN-II is a vessel containing ultra pure xenon, which acts as the target substance. Most of the xenon is held as a liquid, with a layer of gaseous xenon above it. The idea is that incoming WIMPs will knock electrons from the atoms in the liquid xenon. These electrons are then accelerated by an applied electric field and reach the gaseous layer, passing through it and causing ionisation. An array of highly sensitive photomultiplier tubes is set up to detect the faint flashes of light caused by the scintillation and electroluminescence of the liquid and gaseous xenon respectively. The experiment is surrounded by a wall of lead bricks to reduce any residual background radiation in the mine. Studies are also made into how the experiment responds to a known source of radiation, so the detector characteristics can be determined and the whole device calibrated. DRIFT-II stands for Directional Recoil Identification From Tracks. As the name suggests this experiment attempts to determine the direction from which any WIMPs may originate. If our galaxy does include a halo of dark matter then the Sun’s motion through space should cause a WIMP ‘wind’ to pass through the detector. A very rough analogy would be insects hitting a car windscreen. DRIFT-II is comprised of a large stainless steel vessel containing 167 g of gaseous carbon disulphide (CS2) filling a 1 m3 region. WIMPs passing through the detector should bounce off nuclei within the CS2 molecules, the nuclei recoiling and producing ionisation trails within the gas. An applied electric field causes these trails to drift to the edge of the chamber where the resulting charge is read out and directional information obtained. This arrangement is known as a Time Projection Chamber (TPC). The chamber is surrounded by a layer packed with plastic granules. The plastic is rich in hydrogen which is a good absorber of residual background neutron radiation. Sean explained that DRIFT-II will ultimately consist of a whole set of these experiment modules which could be laid like eggs down the mine! Having multiple modules increases the volume of target material and the chances of detecting WIMPs, as well as adding to the directional resolution. There are also several studies underway to identify and measure the various types of background radiation present in the underground laboratory, and seek ways to suppress them. Such radiation includes the neutron background already mentioned, gamma rays, and residual cosmic ray muons. So has dark matter been detected yet? Well at the time of writing no, but absence of evidence is not yet taken to be evidence of absence! Earlier versions of the ZEPLIN and DRIFT experiments have provided vital knowledge in refining the detection techniques. Indeed, the experiments we saw are still being commissioned and there is much work ahead for the teams involved. Boulby Lab is just a part of a wider international collaboration called ILIAS (Integrated Large Infrastructures for AStroparticle physics) which also includes underground experiments in France, Italy and Spain as well as cooperation with universities in the US. After leaving the experiment area and changing out of our clean room overalls we had time to reflect on what we had seen and where we were before heading back to catch our ride up to the surface. Sean asked us if we would like to go back the way we came, or take the longer ‘hot and dirty’ route back through the mine! We unanimously opted for the latter as this would allow us to see more of the mine and experience the high temperatures found in tunnels containing the return air flow. Upon leaving the lab Sean pointed out further evidence of the slow creep of the surrounding rock salt in the form of marks inscribed over the past several years from a pencil attached to a fixed length of string hanging from the ceiling. After leaving the lab the walk back soon involved stepping through another metal door and into a world of warmth, dust and darkness. The air temperature must have been in the 40s Celsius but dry and not uncomfortable - at least in my own experience and in the short time we were there. A haze of dust permeated the air and caught the beams of our helmet lights as we trudged over crushed rock salt ‘sand’ and in some places over sections of pipe and other detritus of mining. Apparently the dust is not a problem to the miners who work down here as it is salt not silica, and dissolves in the body rather than building up in the lungs. Chunks of rock salt lay on the ground in places and we could examine the glittering halite crystals it is composed of. There were side chambers (‘stubs’) with piles of equipment and we passed a massive but currently silent mining machine all caked with dirt like the corpse of some long dead dinosaur. We eventually reached the shaft bottom and already a raucous crowd of miners happy to be at the end of their shift were waiting for their ride back up to the surface. As the cage arrived they spontaneously broke out into a rendition of Who Let the Dogs Out! Being dark matter science types we had the topmost section of the cage to ourselves (for it had three compartments - one on top of each other). This involved climbing a short flight of metal stairs and crouching very low through a small door in the side of the cage, avoiding banging one’s head on a massive steel boss in the ceiling of the cage. Naturally health and safety is a major feature at Boulby and Sean was most vigilant in this respect! On the six minute ride back up Sean played his helmet light on the sides of the shaft so we could get a sense of our motion and pointed out the fibre optic cable running down the shaft that provides an internet connection for the underground lab. We clambered out of the cage and handed the brass tokens to the attendant to signify our return to the surface. It was already dark outside and despite the excitement of being down the mine the fresh air was a welcome change. Back in the John Barton building we changed out of our mine gear and it was into the kitchen for welcome cups of tea and coffee all round! I am sure I speak for all of us on the trip when I say that the visit to the Boulby Underground Laboratory was a truly awesome experience and on behalf of the DDAS thank Dr Sean Paling for being such an excellent guide. 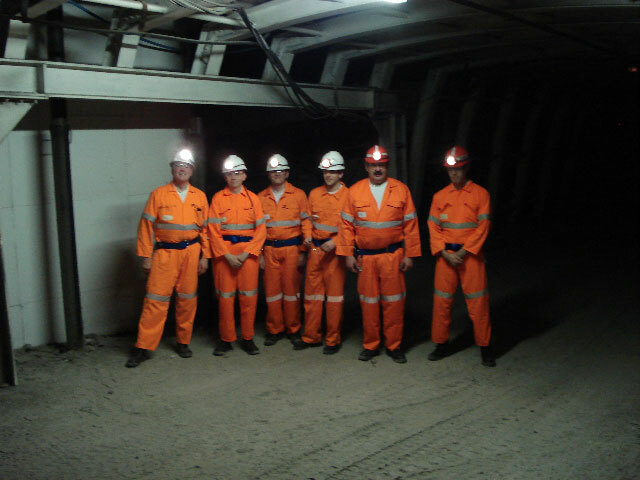 Thanks also to the UKDMC and Cleveland Potash for allowing us this trip down the mine.